Over 1,100 Global Study Bibles and 3,500 christian books for distribution to pastors and others are still being held in Kampala! 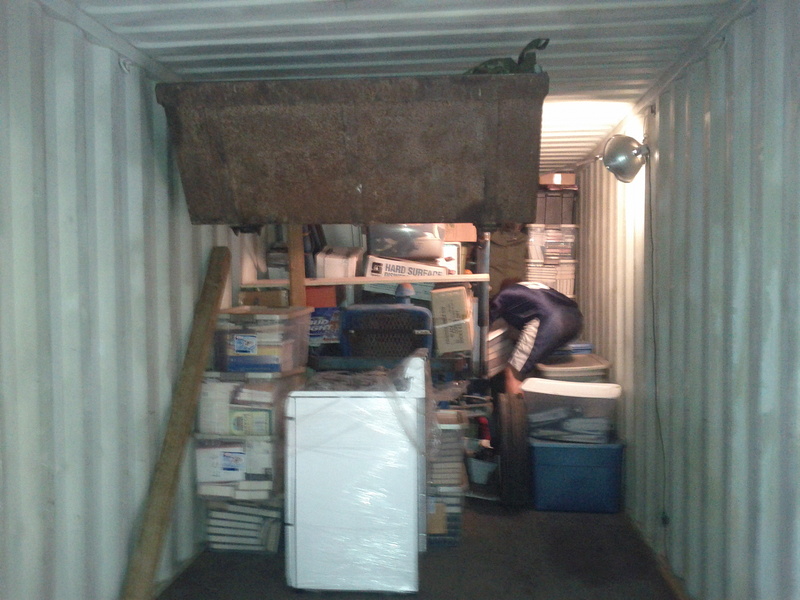 I received an email late last night updating me on the status of the RAU container. From my previous reports you know the container has been held by Ugandan Revenue authorities since mid November. Because of fraudulent practices by a large Ugandan NGO which was abusing its tax exempt status other law abiding, tax exempt NGO’s containers have been held while the government reviews its policies. Pray that this will be parked at RAU soon! RAU received its tax exemption last January and our container was shipped believing the government would honor the exemption they themselves gave. Even though the RAU container was sent before the fraud was discovered they are refusing to release it without paying taxes on its content and the on the container itself.The assessed taxes are in the neighborhood of $25,000. After many personal and written appeals directly to government officials in charge they have repeatedly refused to release the container. The Ugandan President’s Representative for Moyo District (District in Northwestern Uganda where we are located), other brothers I work with, and I have had direct, face to face meetings with the undersecretary with no results. Thomas, the faithful brother, who has been working tirelessly with us on this reported to me last night that it looks as if the government will release the container for $8000 (I have learned that nothing is certain). This does not include assessed storage fees and other “charges” which will likely be around $4000. Thomas will have a more exact number for me on Thursday. This situation, along with the delayed delivery of 1999 Land Cruiser from Japan, has revealed a lot of sinful pride in my heart. I am struggling to overcome anger and to believe the very thing I teach so passionately – the Sovereignty of God in this particular turn of events. The Lord knows I am, in so many ways, a very prideful man…my life time of work ethic and willful determination in completing tasks combined with my sinful and deceitful heart make a very bad potion that can only be killed by a stronger potion—the cross. The remedy of the cross is brokenness and utter dependence. I have to let go…I must let go….and lay hold of Jesus who has hold of me. His grip cannot be broken. His mission cannot and will not fail. To belong to Him and to His mission is more than I could ever have dreamed and by His grace and through the means of that grace I want to press on knowing that the joy set before me is greater than anything this world has to offer and anything Satan and evil men can muster. The container and its precious cargo, which also includes all of our personal treasures and belongings, first and foremost, belongs to the King of kings. I know that many of you, too, have sacrificed of your time and money to get this container to Uganda for the spread of Christ’s fame. He is the Sovereign of the universe and His will will be done! While committing the container into the Lord’s hands and praying for the Lord to turn the hearts of the officials, we will continue with the means God has given us to place God’s things into the hands of His people and for His purpose…spreading the fame of His Name among His people and those unreached/unengaged peoples whom He calls to worship Him! May the Lord grant such grace and mercy! Please stand with us interceding before the throne of grace in our time of need! 1. God chooses to soften the hardened hearts of government officials and they honor the tax exemption they gave us and the container is released with only the storage fees etc. This is what I continue pray for and what we are working for. 2. God provides the necessary $12,000+- needed for its release. 3. The government confiscates the container for lack of payment. 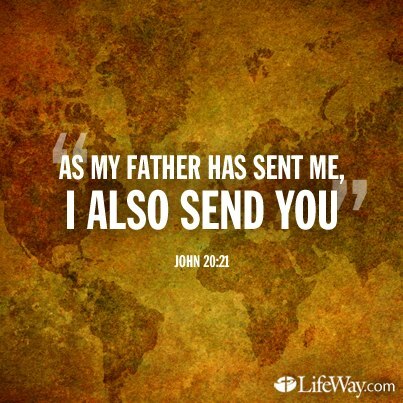 “…Jesus desires to reveal Himself and in so doing, show us the Father! That does not take place on the set of TBN, it takes place on the planes of Africa with a man and a woman who ditched it all and pinched every penny and left every earthly love and tie, to spend the end of life rather than settle down and take rest. … I don’t have the answers for you after my short sojourn and I don’t know what it all looks like. I just, like you, know what He looks like! That He is called faithful and true and as I mentioned before; From the cross pertaining to warfare and redemption and salvation and justification, Jesus did not say, “It has started”! Nope, He said, “It is finished”! …Yours is to become the broken bread that It might perhaps offer nourishment to the nations. As I look through my life and the short labors, it is less about miraculous deliverance and is more about salty, tear filled, stinging faces; that get re-calibrated by the Holy Spirit and head due north instead of East of Eden. So, Reaching Africa’s Unreached? One does not have to ponder long as to why they are Unreached. Africa has not been waiting for a host of people to simply come and harvest her fruit, she has been waiting for a solitary man who comes willing to endure hardship and if Grace be given, but plough a strait row with no heads turned back. Jacob, I mean no disrespect as I say this, Christ came to Africa before the container and He has been there while it was on high seas and He will be there, showing up, touching live, bringing regeneration with or without the metal box and the highly valued, needed and prized Items inside that Box. The glorious and amazing work you and Carol do in and for the Name of The Lord is possibly even tertiary to the work He is doing in both of you. Thank you all for your faithful prayers and support! As in years past the Lord has abundantly blessed Reaching Africa’s Unreached (RAU). All of us at RAU are grateful for God’s sustaining grace and for all who are standing with us with their prayers, encouraging words and gifts. 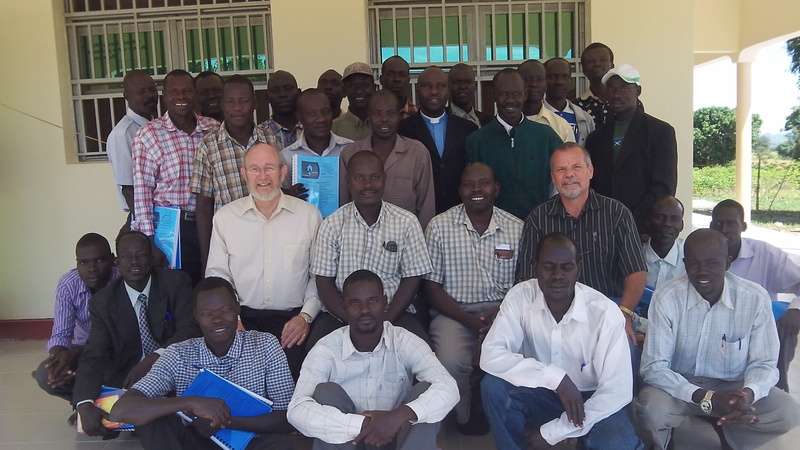 It is an honor to press forward with Jesus’ mission in Northwestern Uganda, Southwestern South Sudan, and Northeastern Democratic Republic of Congo. The RAU vision and mission remain the same. 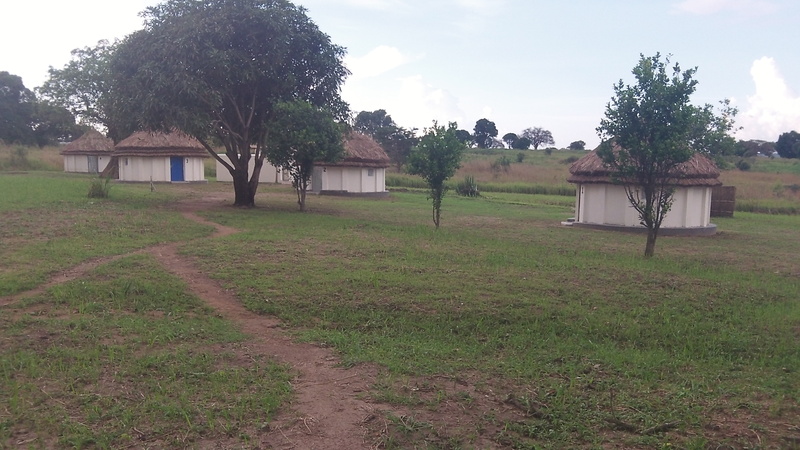 In January, 2011, land was purchased and in August of the same year building work on the RAU Guesthouse/Hall of Tyrannus began. Building in the bush of Africa, many miles from building supplies, has certainly been a challenge. However the Lord has been gracious in provision, wisdom and patience. We praise His holy Name! We have worked hard and have endeavored to spend every dollar/shilling wisely. The ultimate goal of the physical building is to facilitate the vision and mission of RAU in its geographical area for generations to come. 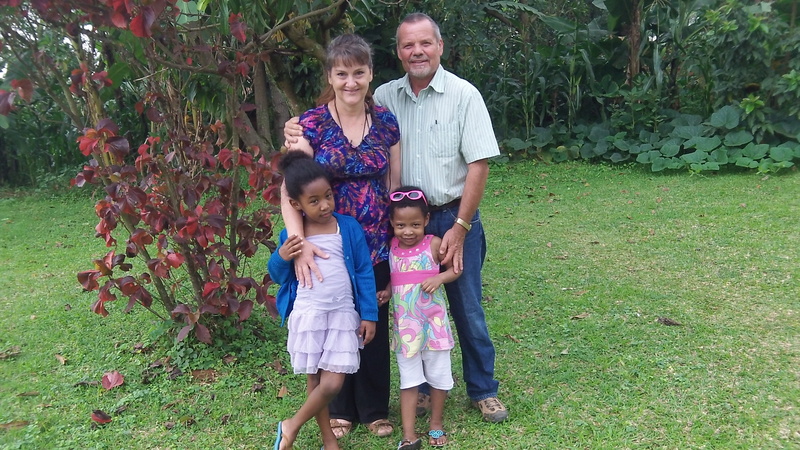 In July, Carol and I moved into the unfinished shell of the Guesthouse and helped in the ongoing work of making the facilities ministry-ready. In August we had our dedication of the Guesthouse/Hall of Tyrannus attended by officials, pastors, and the general public. It was an all day affair! Pictures and videos of the dedication may be found here. Building work continued through December. The water tower was completed, 4 tukalus (able to sleep 17, and with a latrine/bathing station for visiting pastors) were completed, beds (to sleep 29) were built (along with other inside furnishings), an outdoor charcoal kitchen (able to cook for 40+ people and with small attached living quarters for the cook) was finished, 17 acres of brush was cleared and is being made ready for planting soybeans (to bring funds in for the ministry), and a solar electrical system was installed. RAU now has a place to: host pastors for teaching retreats, the ability to host visiting short term mission teams, a facility to mentor church planters, and to be a launching pad for bringing the gospel to nearby unreached areas. May we be faithful in the charge given to us. In late October we had the first Pastors’ Retreat with 31 pastors from various denominations in the Moyo area. Long time friend, Ron Zeiner, from Texas, was our guest teacher. In February, a retreat is planned for Yumbe pastors. Most of the pastors from RAU’s first retreat. Pastors in the region have little or no Biblical training. It is RAU’s expressed desire to help meet that need so that the local churches of the region can be strengthened and become multiplying churches. By God’s grace we will have many RAU pastor’s retreats each year. RAU also hosted two other American teams who had a great interest in its vision for pastors and who wanted to investigate the possibilities of working with RAU to support and propel the mission forward. We appreciate the bond and partnership with our Tennessee friends, David Jones, Michael Lambert and Eric Williams, as well as with the SWI team of Kevin Turner and Ron Day. A great joy of mine has been the opportunity to mentor young men in hopes of launching them out to pastor newly planted churches. 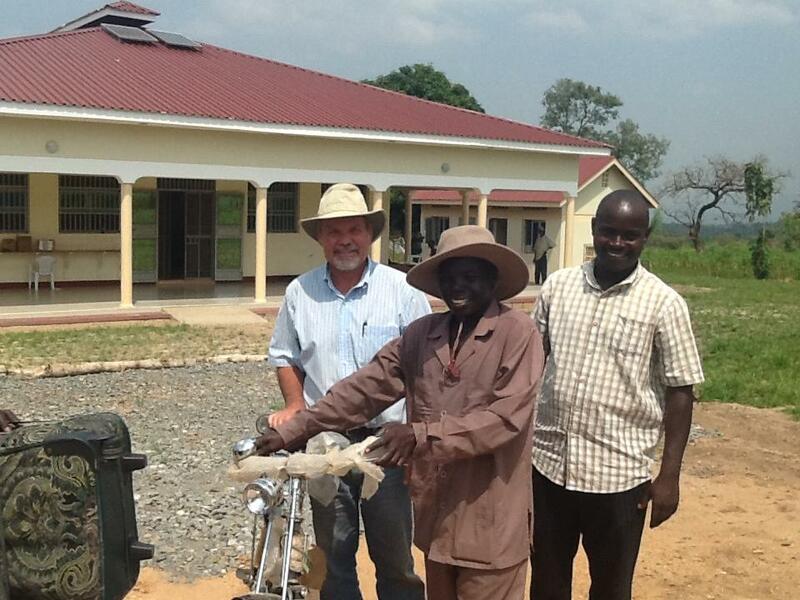 One such man, Godfrey, has been sent to pastor RAU’s first church plant in Obongi town. 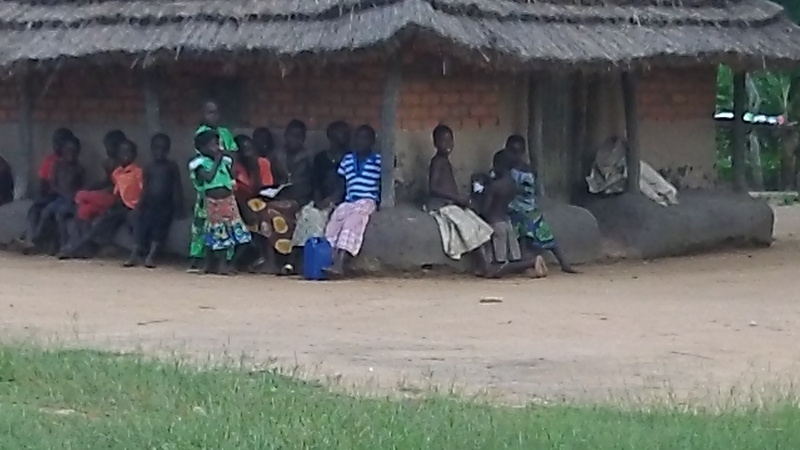 Obongi has a population of 25,000 and had no evangelical churches in it. Now there is a growing church there with many new believers who have been recently baptized. Sam and I with Godfrey before we send him off to RAU’s first church plant. The RAU container reached Kampala in the middle of November and has been held there by the Ugandan revenue authorities. The reason it is being held centers around a NGO which was abusing its tax exempt status; because of this the Ugandan government is looking at all other tax exempt NGO’s very, very closely! RAU’s tax exemption was granted to us last January but the exposed fraud has increased the scrutiny on all tax exempt NGO’s. With one signature the container could be on its way to RAU. 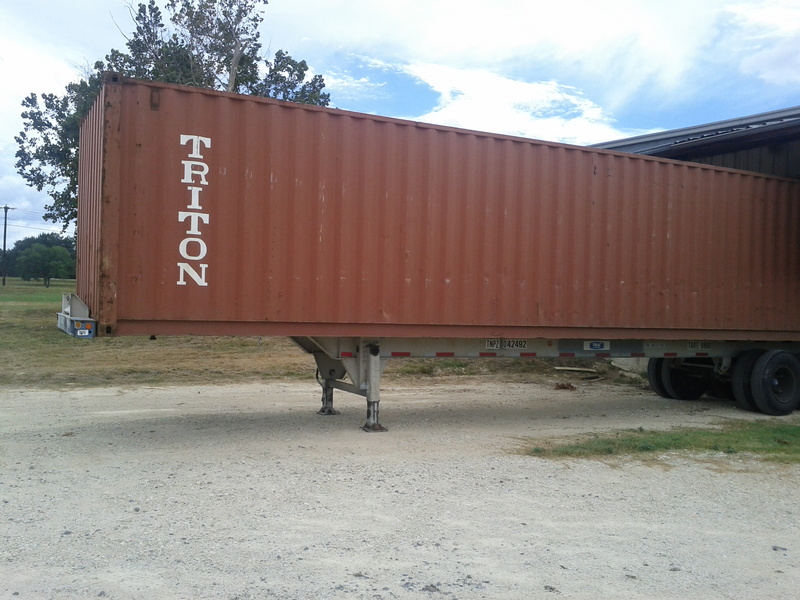 This container is loaded with ministry supplies and 1100 ESV Global Study Bibles/over 3500 Christ exalting Christian books for pastors. Pray, my friends, for its release! The latest news on the ’1999 Land Cruiser which we purchased from Japan in September is that it is due to arrive in January, according to the broker. He continually has pushed the timeline back. Our getting around has been limited, but we have managed by using boda-bodas,taxi’s,buses and for trips to Obongi and Yumbe the goodness of Abraham in transporting us with his vehicle. The Land Cruiser will be a great asset to RAU’s ministry. Please remember this in your prayers! As mentioned earlier, RAU is hosting a pastor’s retreat in February for Yumbe pastors. According to evangelical pastors from Yumbe, the city has less than 1% evangelical Christians in it and is 2 hours from RAU. 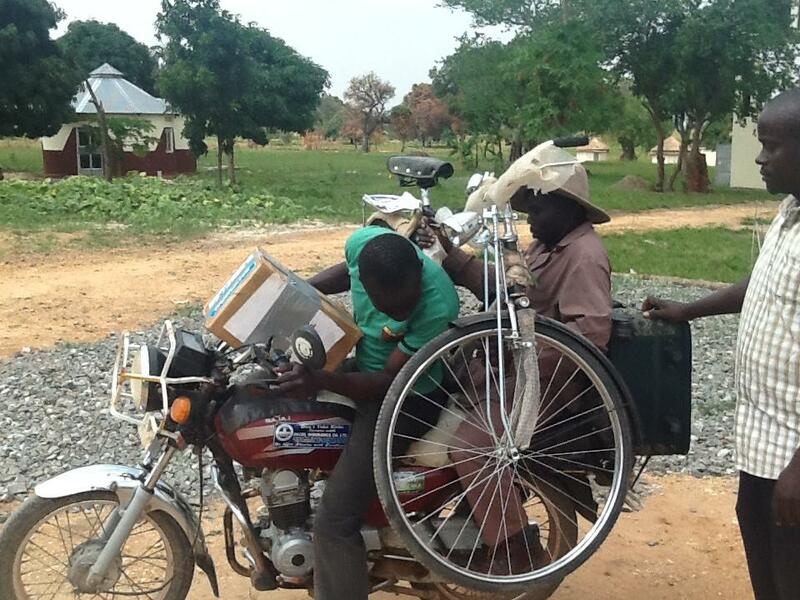 To help effectively reach Yumbe with the gospel there needs to be ongoing and active evangelism and discipleship. 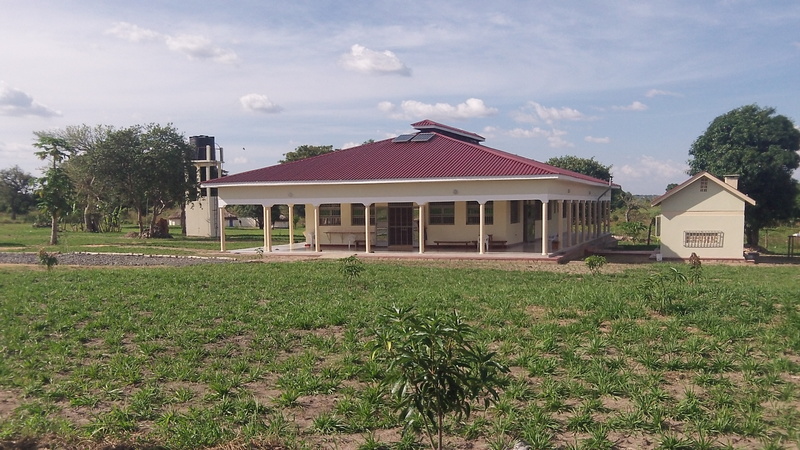 With a Hall of Tyrannus: Yumbe Branch, RAU could have an accessible resource and teaching center for discipleship. With Pastors Ben and Charles. These two pastors have been faithful witnesses Yumbe for many years. The year has ended with turmoil in South Sudan. There has been a coup attempt and, as I write, ongoing fighting in the country which could erupt into a civil war. 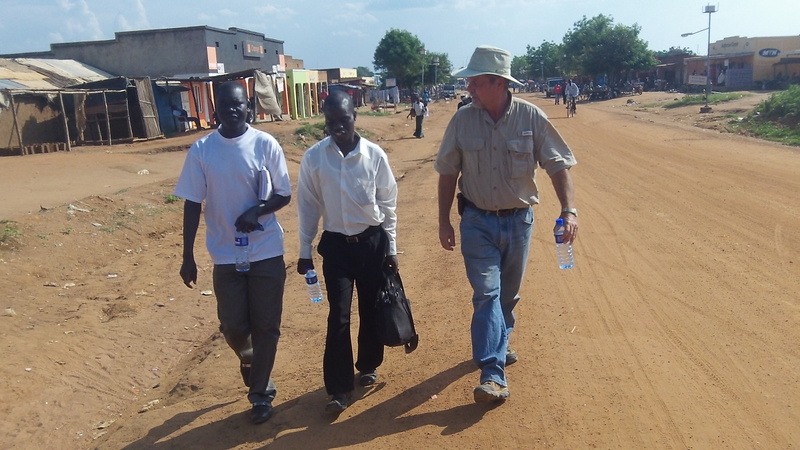 RAU is I mile from the South Sudan border and around 50 miles from the capitol city of Juba. At this point we do not how this will affect the ministry of RAU. There is a possibility of large numbers of refugees coming our way. May the God of peace bring peace to South Sudan for the sake of the Gospel. It has been hard for our current water system to handle the groups we have had so we would like to harvest water off the roof of the Guesthouse by placing an in-ground 80,000 liter tank which could feed the tukalu’s where guest’s stay and provide a backup water supply for the Guesthouse itself. We have a bid for for the whole system (tank, gutters, pipes, labor) for $9,000. We would also like to build more guest quarters for pastors as we did not have enough room for them all at our last pastor’s retreat. With $5,000 we could build to accommodate an additional 20 pastors. 2. As previously mentioned we been actively targeting neighboring Yumbe District and Obongi sub county of Moyo District. With many trips to the regions I have been increasingly burdened for the area. The few churches there and their pastors need the help and encouragement RAU can and is called to give. When we can,we will bring Obongi/Yumbe pastors to RAU for retreats. However, because of the logistics, it is difficult to bring them to RAU as often as needed. That is why we envision, first, a Hall of Tyrannus:Yumbe Branch and then, an Obongi Branch. 3. RAU has a new church plant in the center of Obongi town which we are calling Obongi Town Church. We are believing God for many more church plants. We strongly believe that along with our evangelism there must be a discipleship program for new believers. God’s primary means of discipleship is the local church. The vast majority of Obongi Town Church are new believers and few who were believers before the church was established had no church home. In my last newsletter I shared how we sent out Godfrey, who had been training at RAU for two months, to Obongi . We have 5 more young men in the pipeline who are potential shepherds for church plants. Also I have encouraged pastors to be on the look out for men in their congregations who are also potential pastors for church plants which we are willing to train at RAU. Our working plan for these new congregations is to help support them and their pastors in the beginning with the expressed understanding that financial support is not indefinite but will be available until the church is able to stand more surely on its own; however, as long as RAU exists it would be there for teaching and encouragement. RAU is not starting a new denomination. These new congregations could remain independent or join an existing denomination in the area. As you know, all this will cost money. Please pray for us in these efforts and consider helping us. Thank you! 4. We have actively been clearing RAU’s 17 acres with the hope of putting in two crops of soybeans per year on at least 10 acres. The first planting would be in the beginning of April. The goal is to sell the soybeans and use the money for ministry efforts. We have the tractor but we are still needing a plow/disk. The price for a new disk in Kampala is $5000 but I am on the hunt for a used one which would cost less. With the brush clearing crew. Can you picture soybeans here? 5. 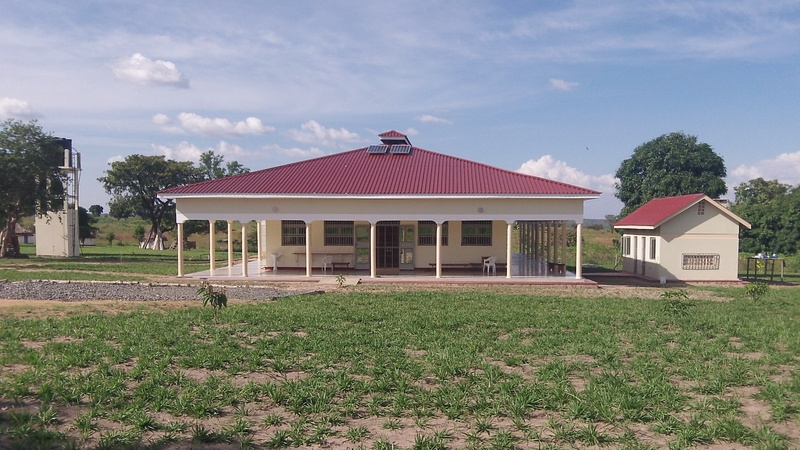 A Medical Clinic and Christian Day School placed on RAU’s land is still a part of vision. We have a page about this at the blog. Medical Care and Education are lacking in the area. Will you be part of the solution? 6. Then, there are the day to day expenses. These costs go up and down in relation to how many we are feeding and how many ministry outings we take. Transport costs here are much higher here in Uganda than in the US. Gas is over $6 a gallon and Diesel is just a bit less per gallon. We need those who will faithfully give each month. No gift is too small. Instructions on how to give a tax deductible charitable monthly gift may be fond at our donation page here. Thank you for your ongoing support and prayers. There must be both sacrificial giving and going for gospel advancement. We are in a ripe harvest field and the Lord has swung open wide the door for us. “Believers who have the gospel keep mumbling it over and over to themselves. Meanwhile, millions who have never heard it once fall into the flames of eternal hell without ever hearing the salvation story.” (K.P. Yohannan). Let it be said that we are not one of these “mumblers“! May your Christmas be blessed! In this time of celebration let us remember those who are suffering and in need of the Savior’s presence and gracious help. I earnestly request your prayers for South Sudan. Some of you may have been keeping up with the news. It has been covered here, in the United States, somewhat, but not as thoroughly as BBC Africa. This past week there was a coup attempt in South Sudan and the violence has been increasing. South Sudan is the newest country in the world; it has not had a smooth start. 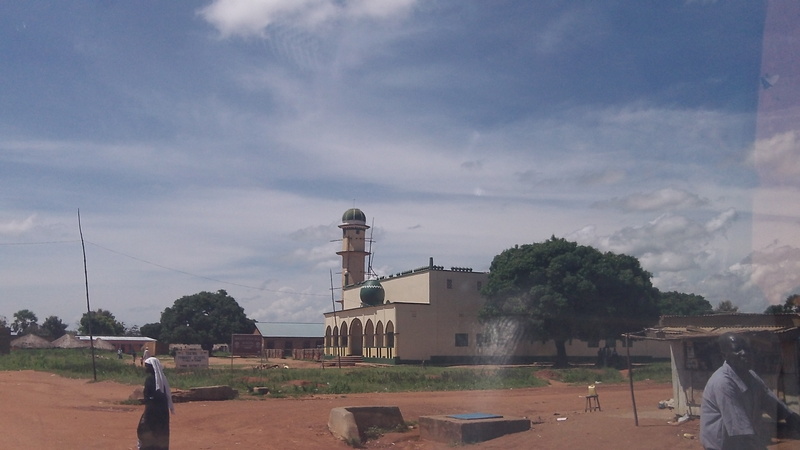 RAU is just on the Ugandan side of the border between Uganda and South Sudan, around 50 miles south of Juba, the capitol city. As refugees flood into Uganda we want to be able to show the love of Jesus to them. As Christians we are called to go to and not away from those who are in the midst of suffering. My dear friend, Kevin Tuner, has often exhorted me, “Jacob,run to the battle!” That is our calling. Please pray for us too as we seek to demonstrate the love of Christ! We fly back to to Entebbe Jan. 13th and then travel by bus to RAU. The only way things ultimately change is by the gospel of grace changing people from the inside out. 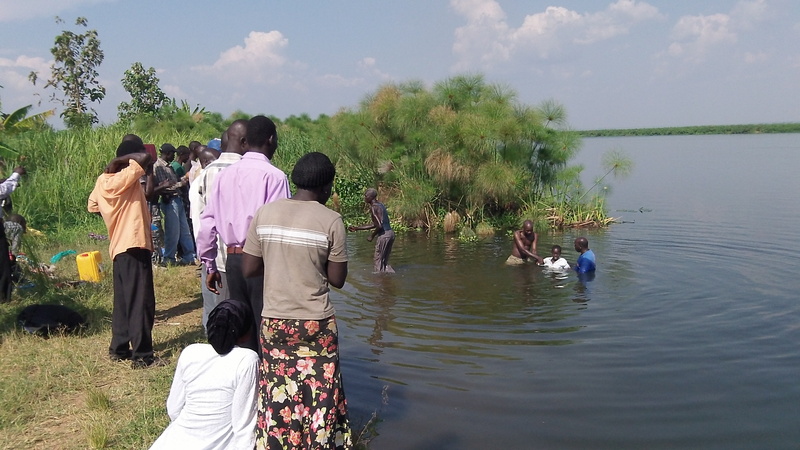 God’s means of doing this is through strong local churches preaching and living out the gospel in their communities and planting other Christ exalting churches where there is no church.There are so many such places in Northwestern Uganda and South Sudan! Thank you all for your faithful prayers and support. May your preparations for Christmas be centered in and around Immanuel and may your celebrations be blessed! Carol and I have slowly been making our way back to Texas for Christmas with family and friends. We leave Entebbe on Tuesday. Both Carol and I are very excited to be with our family and to start playing with and holding the grand kids. Our third grandchild Keira was born while we were here and I have not seen her yet. Our bus trip this last Friday from Moyo to Kampala took 16 hours! From Moyo to Gulu was pretty rough with lots and lots of dust. From Gulu to Kampala it was not too bad, but when we got to Kampala we were held up in traffic for nearly 4 hours. 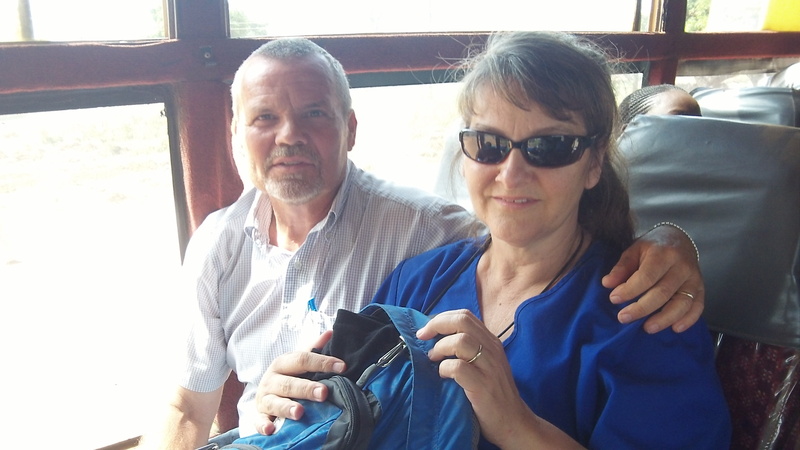 I have had many a dusty, bumpy, African bus rides, but this one was the best because Carol was with me and by my side! The best thing about the bus ride from Moyo to Kampala was being able to sit beside Carol for 16 hours! It is good to be with Pastor Patrick Bukenya and his family. On Monday I have a meeting with federal officials who have had our container on hold now for 4 weeks. The reason it is being held centers around a NGO which was abusing its tax exempt status; because of this the Ugandan gov’t is looking at all other tax exempt NGO’s very, very closely! Pray that I can make a good case Monday morning with gov’t officials for RAU’s tax exemption. Our tax exemption was granted to us last January but the exposed fraud has increased the scrutiny on all tax exempt NGO’s. With one signature the container could be on its way to RAU. 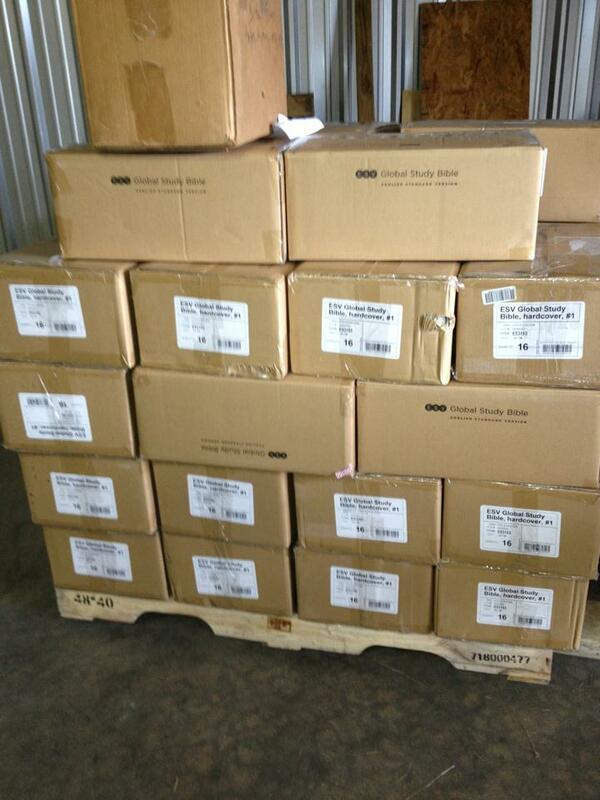 This container is loaded with ministry supplies and 1100 ESV Global Study Bibles/over 3500 Christ exalting Christian books for pastors. Pray, my friends, for its release! The latest news on the ’99 Land Cruiser which we purchased from Japan:it is due to arrive in January, according to the broker. He continually has pushed the timeline back. 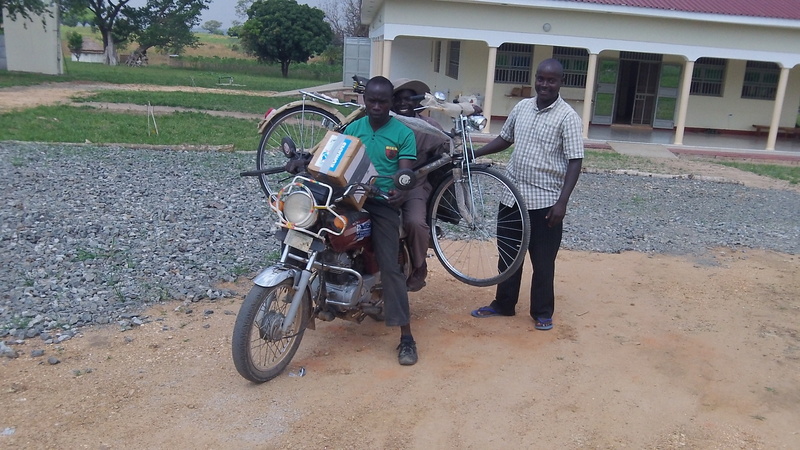 Our getting around has been limited, but we have managed by using boda-bodas,taxi’s,buses and for trips to Obongi and Yumbe the goodness of Abraham in transporting us with his vehicle. The Land Cruiser will be a great asset to RAU’s ministry. Please remember this in your prayers! I am overjoyed in what has been accomplished by God’s grace since we arrived in July. Your prayers and support are a part of the means of getting the gospel to the unreached. Thank you! When we moved into the Guesthouse/Hall of Tyrannus it was a shell and now it has because a center of ministry and a home. I have great hope for what God is going to do in 2014. As 2013 ends please consider Reaching Africa’s Unreached in your end of the year giving. It was hard for our current water system to handle the groups we have had so I would like to harvest water off the roof of the Guesthouse placing an in-ground 80,000 liter tank which could feed the tukalu’s where guest’s stay and provide backup for the Guesthouse itself. We have a bid for for the whole system (tank, gutters, pipes, labor) for $9,000. We would also like to build more guest quarters for pastors as we did not have enough room for them all at our last pastor’s retreat. 2. 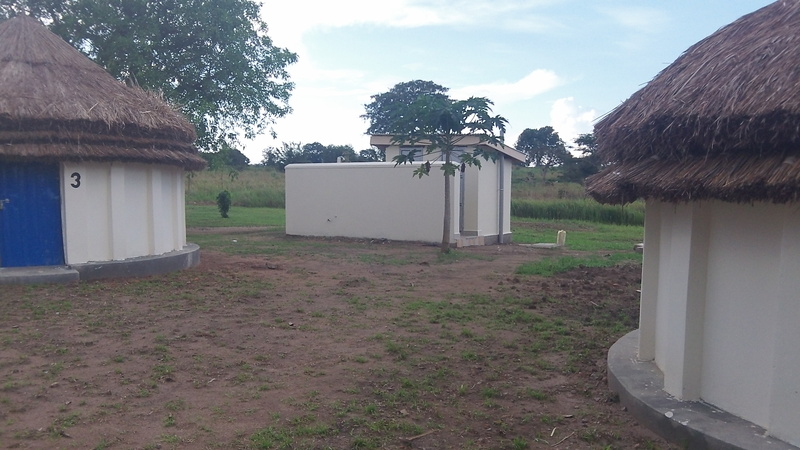 We have been actively targeting neighboring Yumbe District and Obongi sub county of Moyo District. Workers on the ground there state that less than 1% of their population are evangelicals.With many trips to the regions I have been increasingly burdened for the area. The few churches there and their pastors need the help and encouragement RAU can and is called to give. When we can,we will bring Obongi/Yumbe pastors to RAU for retreats. However, because of the logistics, it is difficult to bring them to RAU as often as needed. That is why I envision, first, a Hall of Tyrannus:Yumbe Branch and then, an Obongi Branch. These branches would facilitate the strengthening of the churches there and the planting of other churches. I and others would go to Branches on a weekly basis. There are plots available for purchase. 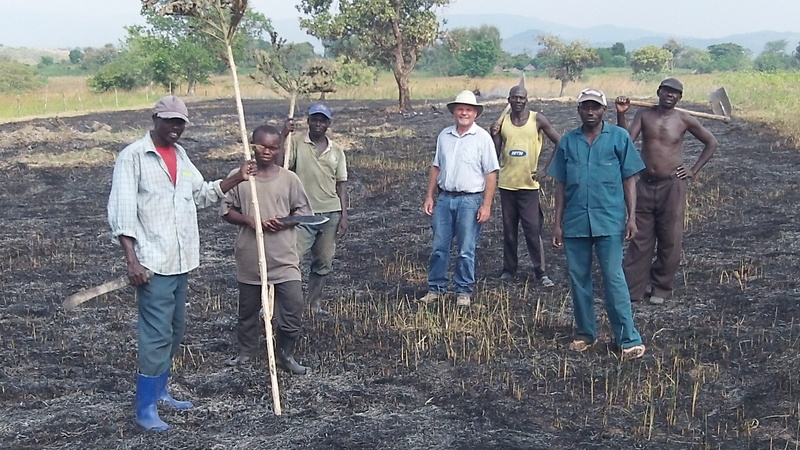 The estimated cost to purchase a plot on Yumbe’s main street and to build a small structure is $15,000. Renting is not a possibility as all the buildings are owned by Muslims and they will not rent to a ministry like ours. 4. We have actively been clearing RAU’s 17 acres with the hope of putting in two crops of soybeans on at least 10 acres. The first planting would be in the beginning of April. The goal is to sell the soybeans and use the money for ministry efforts. We have the tractor but we are still needing a plow/disk. The price for a new disk in Kampala is $5000 but I am on the hunt for a used one which would cost less. 6. Then, there are the day to day expenses. These costs go up and down in relation to how many we are feeding and how many ministry outings we take. 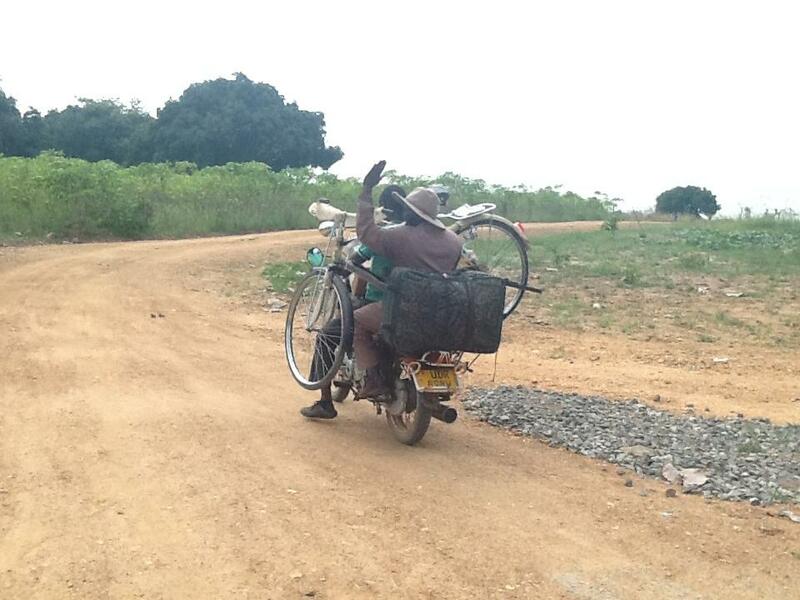 Transport costs here are much higher here in Uganda than in the US. Gas is over $6 a gallon and Diesel is just a bit less per gallon. Thank you for your ongoing support and prayers. There must be both sacrificial giving and going for gospel advancement. We are in a ripe harvest field and the Lord has swung open wide the door for us. “Believers who have the gospel keep mumbling it over and over to themselves. Meanwhile, millions who have never heard it once fall into the flames of eternal hell without ever hearing the salvation story.” (K.P. Yohannan). Let it be said that we are not one of these “mumblers“! 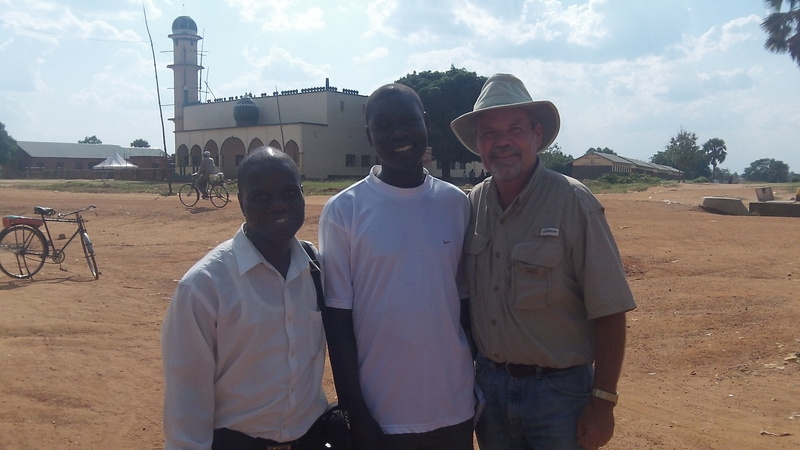 With Pastors Ben and Charles on the main street of Yumbe. These two pastors have been faithful witnesses Yumbe. 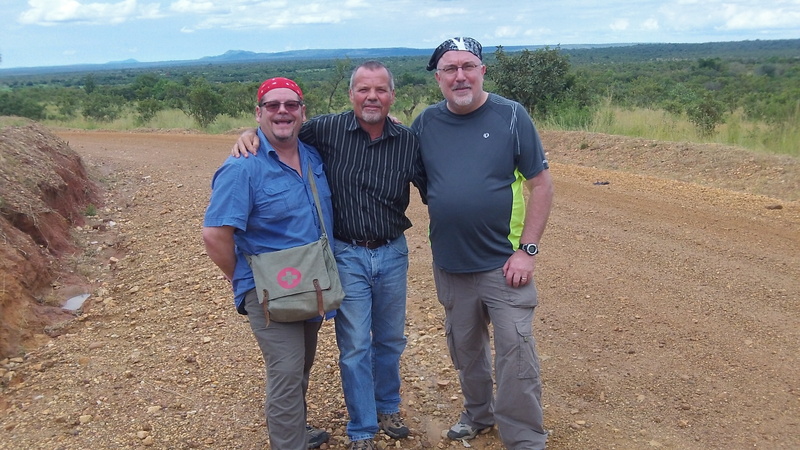 I had a great day in Yumbe on the 10th with Sam and pastors Ben and Charles from Yumbe town. Sam and I took public transport. At any given point there were 10-13 of us packed into a small mini van. With the many stops and slow going what is typically an hour trip one way was 3 hot and dusty hours one way.The hot/dry season has begun. Oh boy! It was worth it though! We all had a very good time of fellowship with Ben and Charles. I was able to get a good interview with them on the general state of Yumbe and plans for Reaching Africa’s Unreached working with the few but zealous pastors of the Yumbe District in proclaiming Jesus. I hope you have been encouraged to pray and support our work in Yumbe! 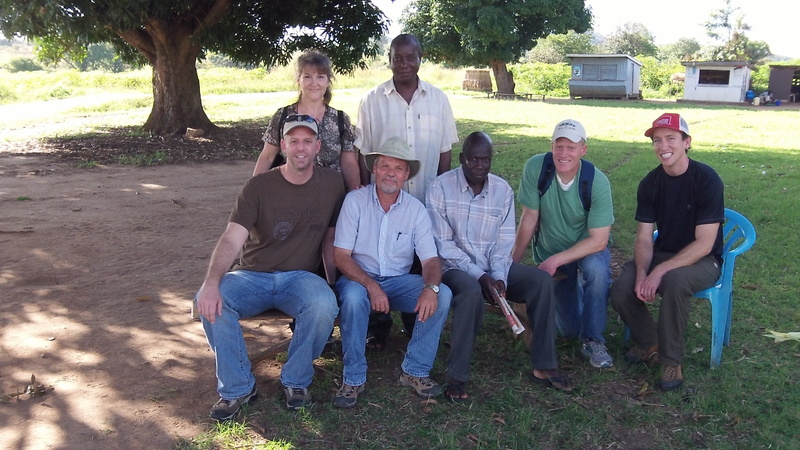 In February we will hosting 17 pastors/church leaders here at RAU from Yumbe. We have an excellent team visiting from America to participate in this ministry week. To make our ministry even more effective in Yumbe we need to have a more constant presence in there. 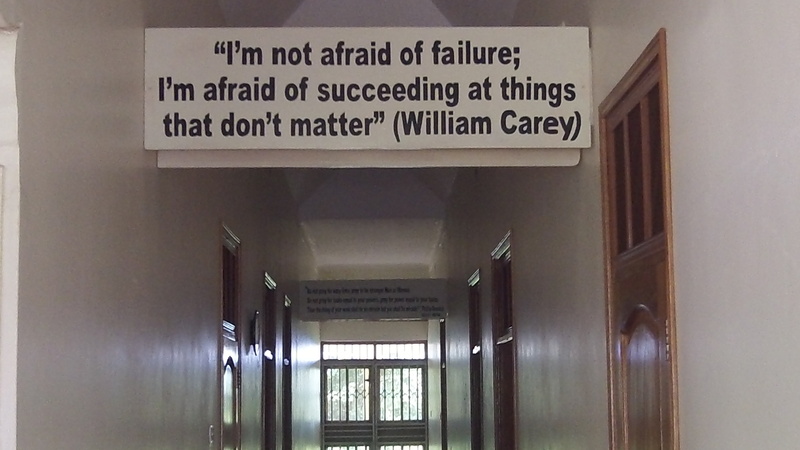 RAU would like to see a small Reaching Africa’s Unreached Hall of Tyrannus teaching/resource center on main street. We would try to come on a weekly basis for teaching and encouragement for local pastors and those called to shepherd new church plants in Yumbe District. Since it is difficult for them to come here to RAU often this would put us in a position to go them often. Only as the church is grounded in the Word will it prosper and grow in Muslim dominated Yumbe! We want all of Yumbe District to hear the gospel just as Asia did in Paul’s Day.